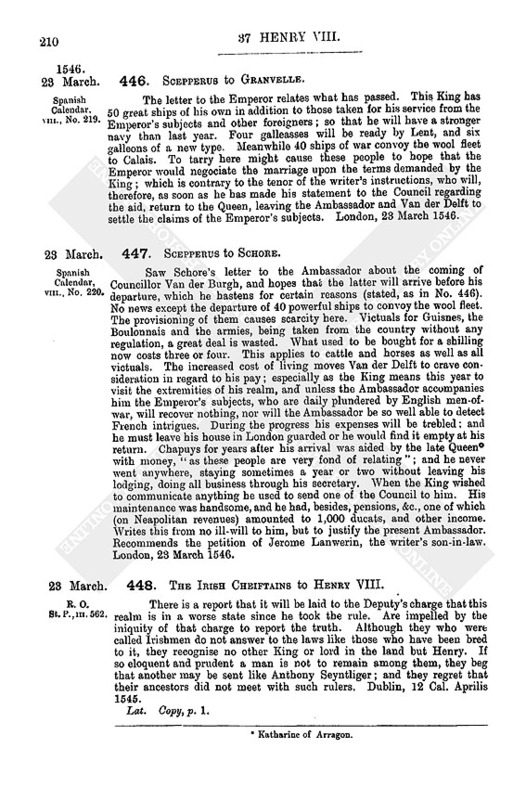 Appointment of Edward earl of Hertford, great chamberlain of England, K.G., as the King's lieutenant in the parts beyond sea, and commander in chief of the army and armada now about to be sent thither; with authority to invade France at discretion, and to order all admirals, vice-admirals and shipmasters there. Parchment. Corrected draft. Endd.. Mynute of my lord of Hertf. commission. 2. Earlier draft of the above, not corrected. Large paper, pp. 2. Endd. : The earle of Hartford his commission for service beyond the seas. Meeting at Greenwich, 21 March. Present: Chancellor, Privy Seal, Great Chamberlain, Essex, Admiral, Winchester, Durham, Cheyney, Gage, Browne, Wingfield, Paget, Petre, Sadler, Riche. 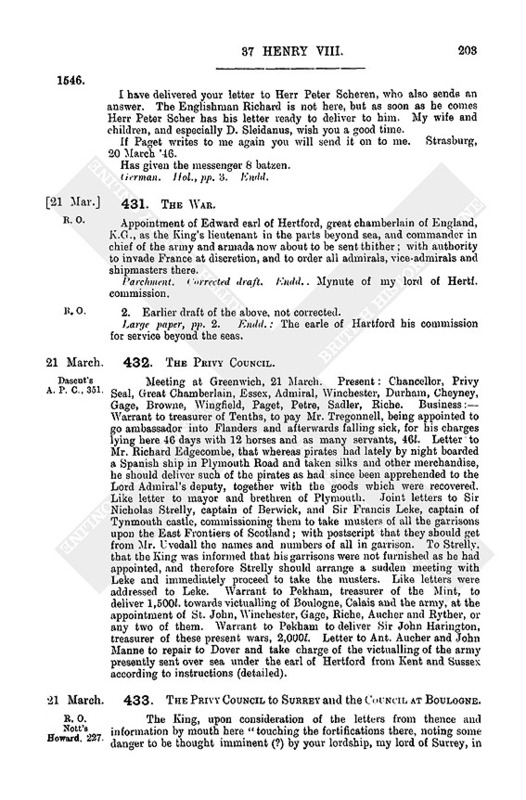 Business:— Warrant to treasurer of Tenths, to pay Mr. Tregonnell, being appointed to go ambassador into Flanders and afterwards falling sick, for his charges lying here 46 days with 12 horses and as many servants, 46l. Letter to Mr. Richard Edgecombe, that whereas pirates had lately by night boarded a Spanish ship in Plymouth Road and taken silks and other merchandise, he should deliver such of the pirates as had since been apprehended to the Lord Admiral's deputy, together with the goods which were recovered. Like letter to mayor and brethren of Plymouth. Joint letters to Sir Nicholas Strelly, captain of Berwick, and Sir Francis Leke, captain of Tynmouth castle, commissioning them to take musters of all the garrisons upon the East Frontiers of Scotland; with postscript that they should get from Mr. Uvedall the names and numbers of all in garrison. To Strelly, that the King was informed that his garrisons were not furnished as he had appointed, and therefore Strelly should arrange a sudden meeting with Leke and immediately proceed to take the musters. Like letters were addressed to Leke. Warrant to Pekham, treasurer of the Mint, to deliver 1,500l. towards victualling of Boulogne, Calais and the army, at the appointment of St. John, Winchester, Gage, Riche, Aucher and Ryther, or any two of them. 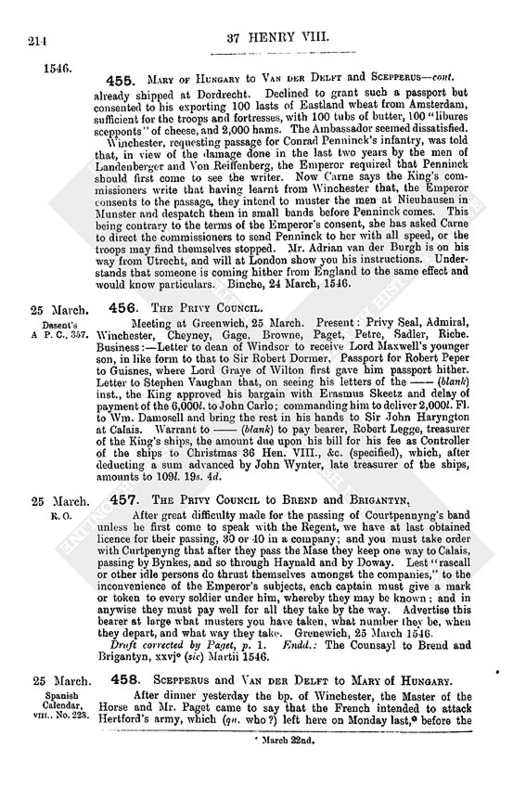 Warrant to Pekham to deliver Sir John Harington, treasurer of these present wars, 2,000l. Letter to Ant. 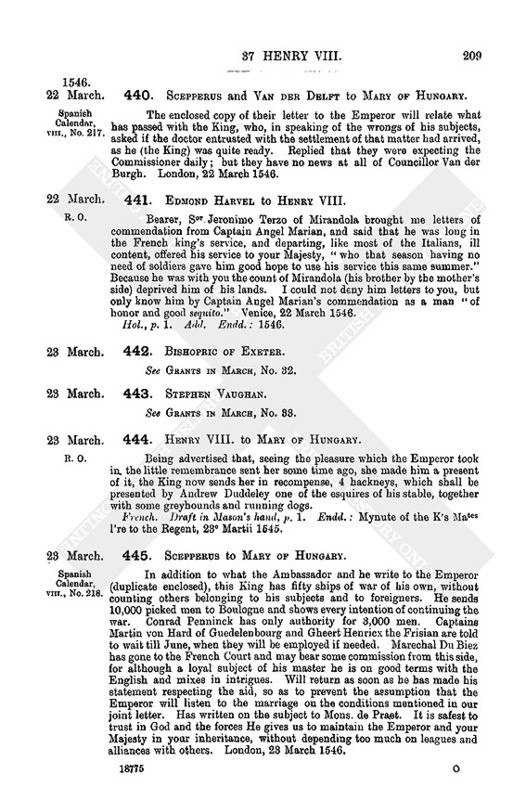 Aucher and John Manne to repair to Dover and take charge of the victualling of the army presently sent over sea under the earl of Hertford from Kent and Sussex according to instructions (detailed). 433. The Privy Council to Surrey and the Council at Boulogne. The King, upon consideration of the letters from thence and information by mouth here "touching the fortifications there, noting some danger to be thought imminent (?) by your lordship, my lord of Surrey, in works appointed to be done there, and considering that you cannot be so well able by writing to express your minds in those matters to the understanding of his Majesty as if you were here present to say, and hear again what can be said, in that behalf, hath thought most convenient to require your Lordship" to confer with such as have knowledge therein, and forthwith to repair hither, leaving the places under your rule in charge of the Marshal during your absence. And as the earl of Hertford, who now repairs over with the army, is appointed lieutenant-general on that side, his Highness requires you, Mr. Marshal, and all you, the rest of the Council there, to obey him. Having fresh advertisement of treasons conspired touching the victuals and munitions there, the King prays them to be watchful. Wrote yesterday that the King, meaning to employ Sir Andrew Flammock on this side, has appointed "you, Sir Richard Wynnebank," to be knight porter of the High Town. The room of under-marshal being thus void, the King has ordained Mr. Croft, whom you lately commended, to be under-marshal. Draft corrected by Petre, pp. 2. Endd. : Mynute from the Counsel to therle of Surrey and Counsayl there, xxjo Martii 1545. 434. Vaughan to Henry VIII. Lately received letters from the Council upon three points, viz., (1) to repay the 18,000l. Fl. due in April, (2) to bring the bargain with the Fugger for 100,000 cr. monthly to some good point, and (3) touching Erasmus Schetz, who says plainly that one whom he sent to make his bargain was promised by the Council "that if he served, he should pay no custom." Has already, as signified in former letters, paid Jeronimo Diodaty and Vincent Baldassar and his company 6,000l. Fl. each and offered John Carolo his 6,000l. Fl., who said that he was written to from London to prolong the debt for other six months. Guesses that he offers this because of Vaughan's telling him that the King took unkindly his refusal to credit Chr. Haller for a like sum. Yesterday he sent a clerk with new bills for the said prolongation, but, as they were made, like the other, for interest at 11 per cent., Vaughan sent them back to be new made, saying that other men were given only 10 per cent. Thinks that he should have had them again this day "if it had not been Sunday." These merchants are each allowed ¾ per cent, for "provision and brokerage." The Fugger has written today to his masters in Almayn and expects answer by next post within 14 days. Jasper Dowche and Vaughan will do their best. "I perceive no great stay but in the bandes, for he will take no more obligations of your city of London till that be paid which is owing." Tried to save the custom of Erasmus Schetz's corn; but he would nowise agree and would gladly have been discharged of his bargain, as corn waxes dearer. Jasper Dowche told me yesterday that he is sent for to Court; and this morning he is gone thither in post. He said that the Emperor was advertised that the French king had sent for 15,000 Suysses, fearing that the Emperor, now going towards Italy, would aid the duke of Savoy to recover his duchy. Dymok lately sent certain pipes with gammons of bacon to be laden "in one of your Majesty's ships that came to waft over your merchants' ships." Knows not how the matter was handled; but the King's ships are departed and the bacon returned hither. Dymok is at Court labouring for the Queen's licence to lade away the corn he bought. Mr. Damsell will see the pipes of gammons sent in some other ship shortly. Andwerp, 21 March. Could bring the money Which remains to Calles. Hol., pp. 3. Add. Endd. : 1545. To the Council's letter brought by Francis, this bearer, makes large answer in his letter to the King. "I understand by Francis that my woman hath been with you. I thank you most heartily for her. She sent me letters by Francis, but he hath lost them by the way. I thank you also for my coming home." If the King pleases, I will carry such money as remains unpaid, with me, to Sir Edw. Wotton at Calles. With the Fugger I will try to set the bargain of 100,000 cr. a month in some honest stay; and fear most "the bande" seeing that he refuses the obligations of London. Jasper is willing to set it forward, but the Fugger's factor here defers resolute answer till he hears from his masters in Almayn, to whom he wrote today, expecting answer in 14 days. "We hear that the Frenchmen make great haste to come forwards. It were good like diligence and more were used by the King's Majesty." Andwerp, 21 March. P.S.—Sends with his letter to the King a copy of Erasmus Schetz's contract, Had to grant that he should not pay custom. Corn grows dearer daily. Hol. pp. 2. Add. Endd. : 1545. 436. Edmond Harvel to Henry VIII. Upon a bruit that the King will make a good band of Italians many captains and soldiers come to offer their services. It is also divulged that the King will give Lady Mary, his daughter, to the prince of Savoy and aid the duke of Savoy to recover his state; which the Frenchmen continually fortify, the prince of Melphy being lately come into Piemont with 200 men of arms and the Sor of Mirandola with the Strocy and other captains hither out of France. They are said to be alarmed at Henry's designs in Italy and the unprovided state of Piemont. It has been affirmed that the French king has sent four galleys to Constantinople to bring the Turkish navy into these parts. The marquis of Guasto sends all his men-of-war into garrison and provisions important towns. From Rome it is reported that the Emperor solicits the Bishop to declare against France "with open power or with money secretly." The Emperor has sent for Don Ferrante Gonsaga, in Sicile, to come to Mantua, where he is expected shortly. The Venetians lately gave title of "governator" to the duke of Urbin with 5,000 cr. yearly and other great commodites. "Of the Council at Trent is small mention or account made, the things staying upon the colloquio and Diet of Ratisbona, as all men 'steemeth." From Constantinople is nothing of moment. The Turk was hunting. Venice, 21 March 1546. P.S.—Captain John Baptista Corso has just come to me secretly, late in the night. He has been in the French service under Strocy, prior of Capua, captain of six French galleys, who lately came hither out of France. Lamenting the ill reward of his long service, he demanded of Strocy licence to depart, who, marvelling, asked the cause. Corso answered, "What can I hope of the French king's service, considering that both you and the Sor Piero your brother hath been most ingratefully intreated for so great service done to that Prince?" Strocy, thus reminded of the bitterness they had met with, is thereby much alienated from the French king and would serve your Majesty. Piero Strocy remains in France "procuring the rest of his credit with the French king," and will be likewise at your command. The Prior is "reputed of great valor in the naval science." If you would know further of this matter Corso will come to you, who appears to be "wise, virtuous and real." He requires it kept secret. Hol. pp. 3. Add. Endd. : 1546. Meeting at Greenwich, 22 March. Present: Chancellor, Privy Seal, Essex, Admiral, Durham, Gage. Business:—Letters addressed to Sir Robert Dormer, of———(blank), Bucks, that the elder of Lord Maxwell's sons, being the King's prisoner and in the keeping of the earl of Hertford, should, now at Hertford's departing over seas, be sent to reside with him, with one attendant, and to be entertained as a gentleman, but with due watch against his escape; and Dormer should undertake delivery of letters to his father, sending them to one of the King's principal secretaries. The said Lord Maxwell's son had placard for horses for himself and servant to Dormer's house. Warrant to Williams to pay the masters of three Flemish hoys lately taken in Boulogne roads with the King's victuals, towards their loss, viz. to Jacob Peterson 25l., Adrian Antonye 20l. and Cornelius Johnson 30l. Warrant to Thos. Chaloner, to pay John Manne out of the 4,000l. received from the Exchequer for payment of Almain horsemen, 200l. 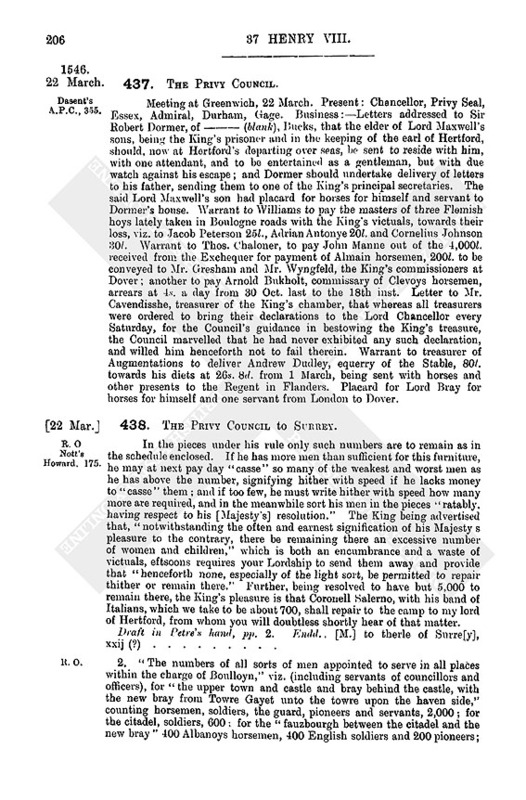 to be conveyed to Mr. Gresham and Mr. Wyngfeld, the King's commissioners at Dover; another to pay Arnold Bukholt, commissary of Clevoys horsemen, arrears at 4s. a day from 30 Oct. last to the 18th inst. 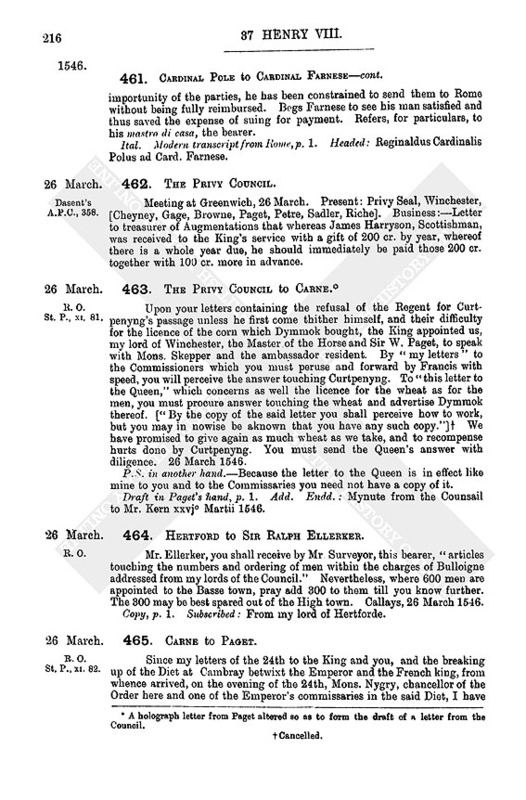 Letter to Mr. Cavendisshe, treasurer of the King's chamber, that whereas all treasurers were ordered to bring their declarations to the Lord Chancellor every Saturday, for the Council's guidance in bestowing the King's treasure, the Council marvelled that he had never exhibited any such declaration, and willed him henceforth not to fail therein. Warrant to treasurer of Augmentations to deliver Andrew Dudley, equerry of the Stable, 80l. towards his diets at 26s. 8d. from 1 March, being sent with horses and other presents to the Regent in Flanders. Placard for Lord Bray for horses for himself and one servant from London to Dover. 438. The Privy Council to Surrey. In the pieces under his rule only such numbers are to remain as in the schedule enclosed. If he has more men than sufficient for this furniture, he may at next pay day "casse" so many of the weakest and worst men as he has above the number, signifying hither with speed if he lacks money to "casse" them; and if too few, he must write hither with speed how many more are required, and in the meanwhile sort his men in the pieces "ratably, having respect to his [Majesty's] resolution." The King being advertised that, "notwithstanding the often and earnest signification of his Majesty s pleasure to the contrary, there be remaining there an excessive number of women and children," which is both an encumbrance and a waste of victuals, eftsoons requires your Lordship to send them away and provide that "henceforth none, especially of the light sort, be permitted to repair thither or remain there." Further, being resolved to have but 5,000 to remain there, the King's pleasure is that Coronell Salerno, with his band of Italians, which we take to be about 700, shall repair to the camp to my lord of Hertford, from whom you will doubtless shortly hear of that matter. 2. "The numbers of all sorts of men appointed to serve in all places within the charge of Boulloyn," viz. (including servants of councillors and officers), for "the upper town and castle and bray behind the castle, with the new bray from Towre Gayet unto the towre upon the haven side," counting horsemen, soldiers, the guard, pioneers and servants, 2,000; for the citadel, soldiers, 600; for the "fauzbourgh between the citadel and the new bray" 400 Albanoys horsemen, 400 English soldiers and 200 pioneers; for the Old Man, soldiers, 800; for the fortification between the Old Man and the citadel, soldiers, 400; for the ministers of victuals 200; total, 5,000. Memorandum, all the Italians to go to the camp, and likewise such of the captains and petty captains lately cassed as Hertford thinks meet. Numbers above 5,000 to be "cassed" at the beginning of the next month. By this distribution is not meant that one of the said places may not at need be succoured from the others. 439. Scepperus and Van der Delft to Charles V.
As thirteen French warships were out between Dover and Calais, Scepperus decided to cross by the high sea from Zeeland, but a change of weather kept his ship at sea between Flushing and England for seven days, driven at one time as far down as Dunkirk. Finally he arrived at London on the 13th, and found this courier with letters from Granvelle. Notified his arrival to the Council and asked for audience; and on the following Monday the King sent Paget to say that he was ill and begged Scepperus to have patience for four or five days. 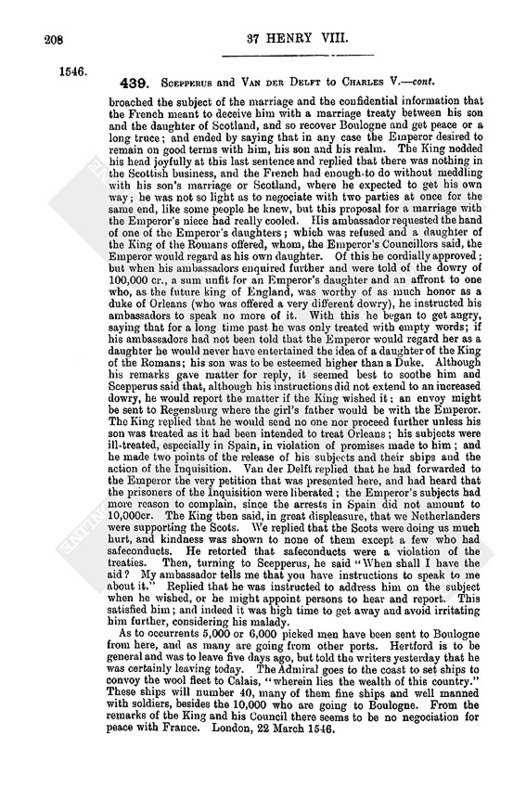 As the King "had been willingly informed by one of his most confidential ministers" of the subjects upon which Scepperus would address him, and the Emperor's letter of 26 Feb. enjoins the discovery of his inclination to the marriage, the writers sounded Paget, who advised them to open the matter to the King although his Majesty thought the dowry proposed far too small. 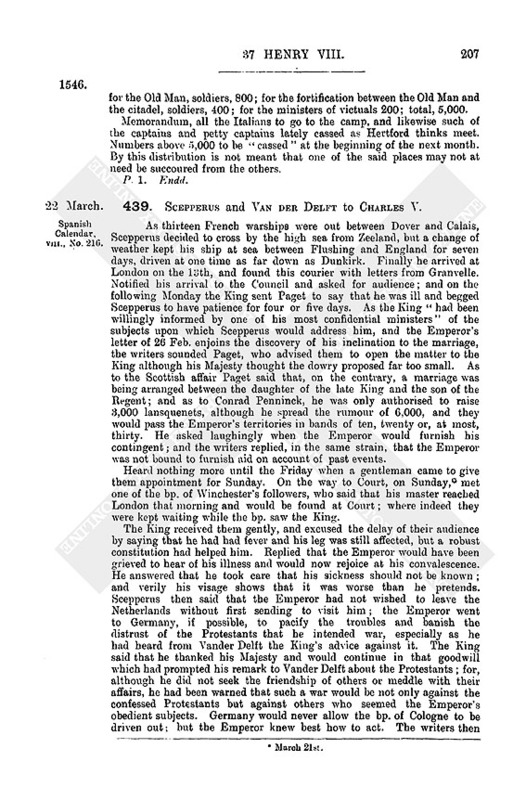 As to the Scottish affair Paget said that, on the contrary, a marriage was being arranged between the daughter of the late King and the son of the Regent; and as to Conrad Penninck, he was only authorised to raise 8,000 lansquenets, although he spread the rumour of 6,000, and they would pass the Emperor's territories in bands of ten, twenty or, at most, thirty. He asked laughingly when the Emperor would furnish his contingent; and the writers replied, in the same strain, that the Emperor was not bound to furnish aid on account of past events. Heard nothing more until the Friday when a gentleman came to give them appointment for Sunday. On the way to Court, on Sunday, (fn. n1) met one of the bp. of Winchester's followers, who said that his master reached London that morning and would be found at Court; where indeed they were kept waiting while the bp. saw the King. The King received them gently, and excused the delay of their audience by saying that he had had fever and his leg was still affected, but a robust constitution had helped him. Replied that the Emperor would have been grieved to hear of his illness and would now rejoice at his convalescence. He answered that he took care that his sickness should not be known; and verily his visage shows that it was worse than he pretends. Scepperus then said that the Emperor had not wished to leave the Netherlands without first sending to visit him; the Emperor went to Germany, if possible, to pacify the troubles and banish the distrust of the Protestants that he intended war, especially as he had heard from Vander Delft the King's advice against it. The King said that he thanked his Majesty and would continue in that goodwill which had prompted his remark to Vander Delft about the Protestants; for, although he did not seek the friendship of others or meddle with their affairs, he had been warned that such a war would be not only against the confessed Protestants but against others who seemed the Emperor's obedient subjects. Germany would never allow the bp. of Cologne to be driven out; but the Emperor knew best how to act. The writers then broached the subject of the marriage and the confidential information that the French meant to deceive him with a marriage treaty between his son and the daughter of Scotland, and so recover Boulogne and get peace or a long truce; and ended by saying that in any case the Emperor desired to remain on good terms with him, his son and his realm. The King nodded his head joyfully at this last sentence and replied that there was nothing in the Scottish business, and the French had enough to do without meddling with his son's marriage or Scotland, where he expected to get his own way; he was not so light as to negociate with two parties at once for the same end, like some people he knew, but this proposal for a marriage with the Emperor's niece had really cooled. His ambassador requested the hand of one of the Emperor's daughters; which was refused and a daughter of the King of the Romans offered, whom, the Emperor's Councillors said, the Emperor would regard as his own daughter. 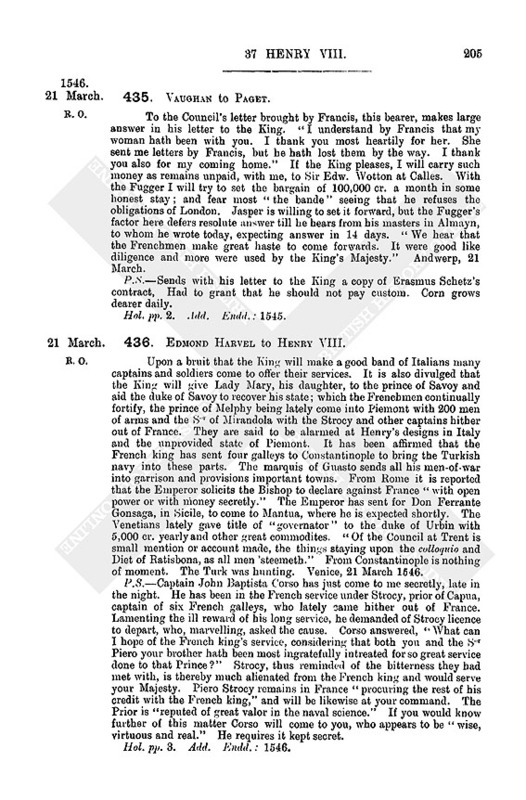 Of this he cordially approved; but when his ambassadors enquired further and were told of the dowry of 100,000 cr., a sum unfit for an Emperor's daughter and an affront to one who, as the future king of England, was worthy of as much honor as a duke of Orleans (who was offered a very different dowry), he instructed his ambassadors to speak no more of it. With this he began to get angry, saying that for a long time past he was only treated with empty words; if his ambassadors had not been told that the Emperor would regard her as a daughter he would never have entertained the idea of a daughter of the King of the Romans; his son was to be esteemed higher than a Duke. Although his remarks gave matter for reply, it seemed best to soothe him and Scepperus said that, although his instructions did not extend to an increased dowry, he would report the matter if the King wished it; an envoy might be sent to Regensburg where the girl's father would be with the Emperor. 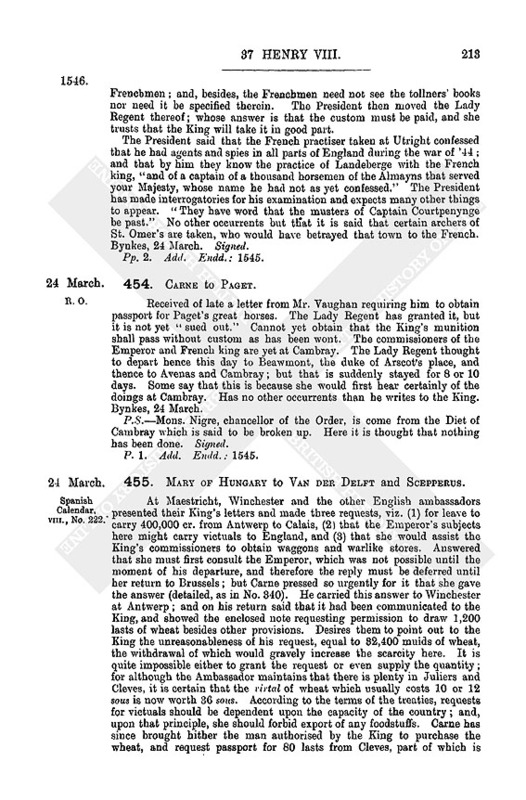 The King replied that he would send no one nor proceed further unless his son was treated as it had been intended to treat Orleans; his subjects were ill-treated, especially in Spain, in violation of promises made to him; and he made two points of the release of his subjects and their ships and the action of the Inquisition. Van der Delft replied that he had forwarded to the Emperor the very petition that was presented here, and had heard that the prisoners of the Inquisition were liberated; the Emperor's subjects had more reason to complain, since the arrests in Spain did not amount to 10,000cr. The King then said, in great displeasure, that we Netherlanders were supporting the Scots. We replied that the Scots were doing us much hurt, and kindness was shown to none of them except a few who had safeconducts. He retorted that safeconducts were a violation of the treaties. Then, turning to Scepperus, he said "When shall I have the aid? My ambassador tells me that you have instructions to speak to me about it." Replied that he was instructed to address him on the subject when he wished, or he might appoint persons to hear and report. This satisfied him; and indeed it was high time to get away and avoid irritating him further, considering his malady. As to occurrents 5,000 or 6,000 picked men have been sent to Boulogne from here, and as many are going from other ports. Hertford is to be general and was to leave five days ago, but told the writers yesterday that he was certainly leaving today. The Admiral goes to the coast to set ships to convoy the wool fleet to Calais, "wherein lies the wealth of this country." These ships will number 40, many of them fine ships and well manned with soldiers, besides the 10,000 who are going to Boulogne. From the remarks of the King and his Council there seems to be no negociation for peace with France. London, 22 March 1546. 440. Scepperus and Van der Delft to Mary of Hungary. The enclosed copy of their letter to the Emperor will relate what has passed with the King, who, in speaking of the wrongs of his subjects, asked if the doctor entrusted with the settlement of that matter had arrived, as he (the King) was quite ready. Replied that they were expecting the Commissioner daily; but they have no news at all of Councillor Van der Burgh. London, 22 March 1546. 441. Edmond Harvel to Henry VIII. Bearer, Sor Jeronimo Terzo of Mirandola brought me letters of commendation from Captain Angel Marian, and said that he was long in the French king's service, and departing, like most of the Italians, ill content, offered his service to your Majesty, "who that season having no need of soldiers gave him good hope to use his service this same summer." Because he was with you the count of Mirandola (his brother by the mother's side) deprived him of his lands. I could not deny him letters to you, but only know him by Captain Angel Marian's commendation as a man "of honor and good sequito." Venice, 22 March 1546. Hol., p. 1. Add. Endd. : 1546. See Grants in March, No. 32. See Grants in March, No. 33. 444. Henry VIII. to Mary of Hungary. Being advertised that, seeing the pleasure which the Emperor took in the little remembrance sent her some time ago, she made him a present of it, the King now sends her in recompense, 4 hackneys, which shall be presented by Andrew Duddeley one of the esquires of his stable, together with some greyhounds and running dogs. French. Draft in Mason's hand, p. 1. Endd. : Mynute of the K's Mates l're to the Regent, 23o Martii 1545. 445. Scepperus to Mary of Hungary. In addition to what the Ambassador and he write to the Emperor (duplicate enclosed), this King has fifty ships of war of his own, without counting others belonging to his subjects and to foreigners. He sends 10,000 picked men to Boulogne and shows every intention of continuing the war. Conrad Penninck has only authority for 3,000 men. Captains Martin von Hard of Guedelenbourg and Gheert Henricx the Frisian are told to wait till June, when they will be employed if needed. Marechal Du Biez has gone to the French Court and may bear some commission from this side, for although a loyal subject of his master he is on good terms with the English and mixes in intrigues. Will return as soon as he has made his statement respecting the aid, so as to prevent the assumption that the Emperor will listen to the marriage on the conditions mentioned in our joint letter. Has written on the subject to Mons. de Praet. It is safest to trust in God and the forces He gives us to maintain the Emperor and your Majesty in your inheritance, without depending too much on leagues and alliances with others. London, 23 March 1546. The letter to the Emperor relates what has passed. This King has 50 great ships of his own in addition to those taken for his service from the Emperor's subjects and other foreigners; so that he will have a stronger navy than last year. Four galleasses will be ready by Lent, and six galleons of a new type. Meanwhile 40 ships of war convoy the wool fleet to Calais. To tarry here might cause these people to hope that the Emperor would negociate the marriage upon the terms demanded by the King; which is contrary to the tenor of the writer's instructions, who will, therefore, as soon as he has made his statement to the Council regarding the aid, return to the Queen, leaving the Ambassador and Van der Delft to settle the claims of the Emperor's subjects. London, 23 March 1546. Saw Schore's letter to the Ambassador about the coming of Councillor Van der Burgh, and hopes that the latter will arrive before his departure, which he hastens for certain reasons (stated, as in No. 446). No news except the departure of 40 powerful ships to convoy the wool fleet. The provisioning of them causes scarcity here. Victuals for Guisnes, the Boulonnais and the armies, being taken from the country without any regulation, a great deal is wasted. What used to be bought for a shilling now costs three or four. This applies to cattle and horses as well as all victuals. 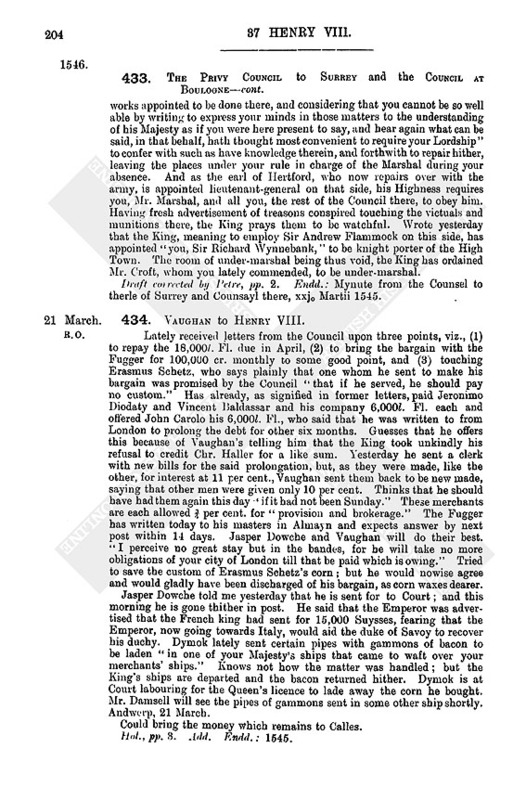 The increased cost of living moves Van der Delft to crave consideration in regard to his pay; especially as the King means this year to visit the extremities of his realm, and unless the Ambassador accompanies him the Emperor's subjects, who are daily plundered by English men-of-war, will recover nothing, nor will the Ambassador be so well able to detect French intrigues. During the progress his expenses will be trebled; and he must leave his house in London guarded or he would find it empty at his return. Chapuys for years after his arrival was aided by the late Queen (fn. n2) with money, "as these people are very fond of relating"; and he never went anywhere, staying sometimes a year or two without leaving his lodging, doing all business through his secretary. When the King wished to communicate anything he used to send one of the Council to him. His maintenance was handsome, and he had, besides, pensions, &c., one of which (on Neapolitan revenues) amounted to 1,000 ducats, and other income. Writes this from no ill-will to him, but to justify the present Ambassador. Recommends the petition of Jerome Lanwerin, the writer's son-in-law. London, 23 March 1546. 448. The Irish Cheiftains to Henry VIII. There is a report that it will be laid to the Deputy's charge that this realm is in a worse state since he took the rule. Are impelled by the iniquity of that charge to report the truth. Although they who were called Irishmen do not answer to the laws like those who have been bred to it, they recognise no other King or lord in the land but Henry. If so eloquent and prudent a man is not to remain among them, they beg that another may be sent like Anthony Seyntliger; and they regret that their ancestors did not meet with such rulers. Dublin, 12 Cal. Aprilis 1545. I arrived here today at 3 p m., and most of our men are yesterday and today come over; trusting that all will be here tomorrow night except such as come along the seas, and our ordnance and munition. The sacks being embarked at Dover "in vessels of greater charge than percase can arrive in the haven at Hammyltewe, the tides being neepe and spending tides," ordered one Watson (who was with my lord Admiral and me at our late being at Hamyltewe) to go thither in my own pinnace tomorrow morning and sound the haven. On his return tomorrow, our ordnance and munition being once arrived, we will lose no time in executing our matters. Calais, 23 March 1545. Signed. P. 1. Add. (in haste). Sealed. Endd. 450. J. Dymmock to Paget. Wrote from Bynkes to the Council touching the licence granted to Sir Edward Karne and him for lading away provisions. It was "so good and large" that, but for fear, of the King's displeasure, he would have refused it, they having sued for leave for the four ships at Dorte laden with corn of Cleveland and Gulycke land. At Dorte is bought and paid for 266 last of wheat and rye, "the fairest stuff that ever you did see." I desire you to see what will be done with Scyperus; and I will go towards Dorte tomorrow and try bribing the customers and other officers. Receiving the money at Andwarppe has hampered him. A letter is come from Chr. Coke of Breame declaring that the 1,000 qr. of wheat which Mr. Watson bargained for are shipped, and the lords of Breame give the King leave to ship as much wheat as he can get. Has already sent money thither to buy 2,000 qr., as he has divers times written. The Regent's licence only serves for 1,000 qr. of Estlande corn, 100 barrels of butter, 2,000 "gambons" and 120 weighs of cheese. "Bacon none would be granted, whereof I was not sorry, for the bacon is too fat. Our men would not have eaten it." Sent down into Seland to the two wafters the 3,005 gambons of bacon, in 16 pipes and dryefattes; but the captains of the wafters took a boat of 36 tons "which was come out of Scotland, and was belonging unto the bailiff of Flyssynge, and so made haste away" without tarrying for the gambons, which are come again to Andwarppe. These were bought before Paget wrote that he should send no gambons; and also 8,000 lb. (about 1,600 gambons) are bought at Amsterdam, bought at 2¼d. Fl. the lb. As fish cannot be had in time to serve this Lent, will buy none till he hears from Paget. The spiritual men of Uttericght and Colen say that the Prodestantes have been in England to know whether, if the Emperor made war against them, the King would take part with the Emperor, and that Prodestants' "inbascyottors" (ambasadors) had answer "that his Majesty and th'Emperor were in league together, which he would keep." My informant is "one of the chief rulers of a place called Over Ryssell besides Fryeseland, and one that knows all the subtlety and crafty dealing of this Court; for I have heard Mr. Karne say that the Prodestants' ambassadors were at Mastrycght with the Emperor, that they did come in after a sort as though they would do as the Emperor would have them; which thing is not so, and if any man do advertise the King's majesty after such sorts he does not well, for this party, which has declared this unto me, he has the copy of the declaration and their instructions which the Prodestantts had to the Emperor, which copy he has promised for to give me at his coming from Byncks; for, by his saying, the Protestants' ambassadors did declare their message somewhat sharply, and at this time is an occasion that the Emperor does so hastily go up towards the Corvostes." I would be loth that the King should be untruly informed, and thereupon "forsake that thing which some other would perchance take and hereafter turn to his Majesty's displeasure." Feels bound to write this, as he sees the House of Bourgoynne so crafty in all their doings that when they have their purpose they pass no more upon their treaties and promises, "but ar redye for to overwelem every countre and make an inheritansse, and in fynne loke for to governe all the woreld." Andwerppe, 23 March 1545. It he could write well he would write the above to the King, "for surely his Grace is no longer loved nor when they have need of his Grace; and he that tells his Grace otherwise they do not well." Hol., pp. 4. Add. Endd. 451. Juan de Vega to Charles V.
The Pope's quarrel with the duke of Florence, and arrest of a secretary of the Duke. The prevailing opinion about this is that, seeing himself driven into a corner with the Council, and having received certain other intelligence, His Holiness would like to raise any disturbance whatever to divert attention. 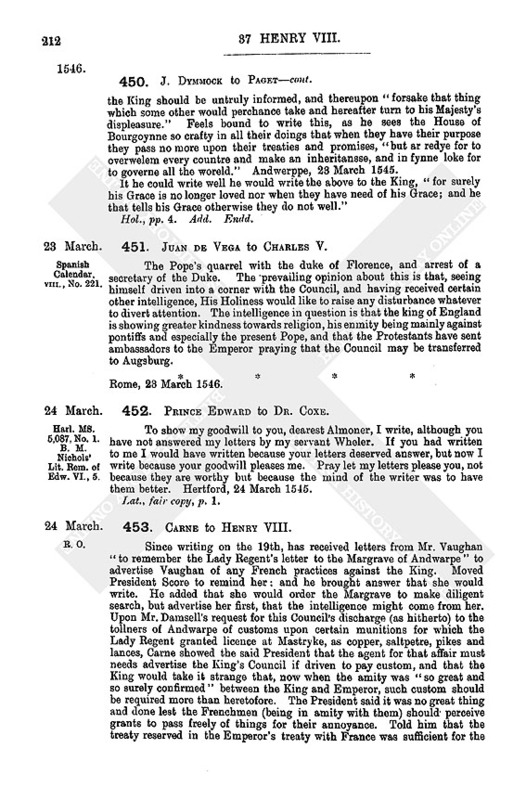 The intelligence in question is that the king of England is showing greater kindness towards religion, his enmity being mainly against pontiffs and especially the present Pope, and that the Protestants have sent ambassadors to the Emperor praying that the Council may be transferred to Augsburg. 452. Prince Edward to Dr. Coxe. To show my goodwill to you, dearest Almoner, I write, although you have not answered my letters by my servant Wheler. If you had written to me I would have written because your letters deserved answer, but now I write because your goodwill pleases me. Pray let my letters please you, not because they are worthy but because the mind of the writer was to have them better. Hertford, 24 March 1545. Lat., fair copy, p. 1. 453. Carne to Henry VIII. Since writing on the 19th, has received letters from Mr. Vaughan "to remember the Lady Regent's letter to the Margrave of Andwarpe" to advertise Vaughan of any French practices against the King. Moved President Score to remind her: and he brought answer that she would write. He added that she would order the Margrave to make diligent search, but advertise her first, that the intelligence might come from her. 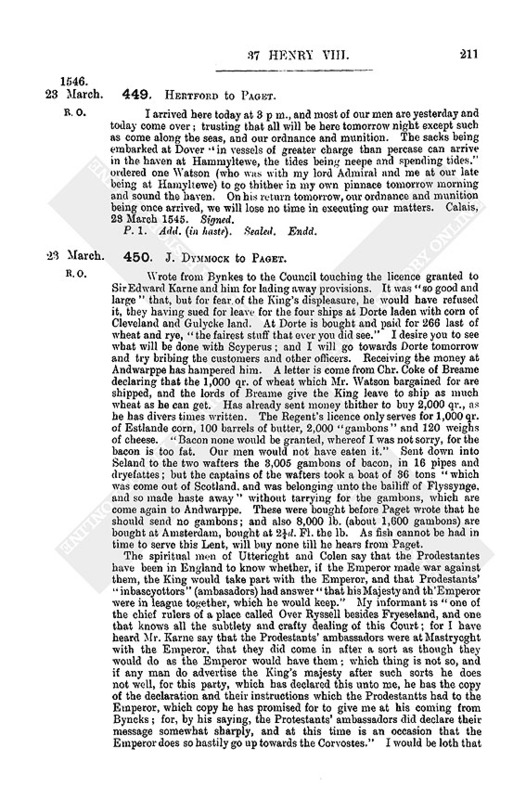 Upon Mr. Damsell's request for this Council's discharge (as hitherto) to the tollners of Andwarpe of customs upon certain munitions for which the Lady Regent granted licence at Mastryke, as copper, saltpetre, pikes and lances, Carne showed the said President that the agent for that affair must needs advertise the King's Council if driven to pay custom, and that the King would take it strange that, now when the amity was "so great and so surely confirmed" between the King and Emperor, such custom should be required more than heretofore. The President said it was no great thing and done lest the Frenchmen (being in amity with them) should' perceive grants to pass freely of things for their annoyance. Told him that the treaty reserved in the Emperor's treaty with France was sufficient for the Frenchmen; and, besides, the Frenchmen need not see the tollners' books nor need it be specified therein. The President then moved the Lady Regent thereof; whose answer is that the custom must be paid, and she trusts that the King will take it in good part. The President said that the French practiser taken at Utright confessed that he had agents and spies in all parts of England during the war of '44; and that by him they know the practice of Landeberge with the French king, "and of a captain of a thousand horsemen of the Almayns that served your Majesty, whose name he had not as yet confessed." The President has made interrogatories for his examination and expects many other things to appear. "They have word that the musters of Captain Courtpenynge be past." No other occurrents but that it is said that certain archers of St. Omer's are taken, who would have betrayed that town to the French. Bynkes, 24 March. Signed. Pp. 2. Add. Endd. : 1545. Received of late a letter from Mr. Vaughan requiring him to obtain passport for Paget's great horses. The Lady Regent has granted it, but it is not yet "sued out." Cannot yet obtain that the King's munition shall pass without custom as has been wont. The commissioners of the Emperor and French king are yet at Cambray. The Lady Regent thought to depart hence this day to Beawmont, the duke of Arscot's place, and thence to Avenas and Cambray; but that is suddenly stayed for 8 or 10 days. Some say that this is because she would first hear certainly of the doings at Cambray. Has no other occurrents than he writes to the King. Bynkes, 24 March. P.S.—Mons. Nigre, chancellor of the Order, is come from the Diet of Cambray which is said to be broken up. Here it is thought that nothing has been done. Signed. P. 1. Add. Endd. : 1545. 455. Mary of Hungary to Van der Delft and Scepperus. At Maestricht, Winchester and the other English ambassadors presented their King's letters and made three requests, viz. (1) for leave to carry 400,000 cr. from Antwerp to Calais, (2) that the Emperor's subjects here might carry victuals to England, and (3) that she would assist the King's commissioners to obtain waggons and warlike stores. Answered that she must first consult the Emperor, which was not possible until the moment of his departure, and therefore the reply must be deferred until her return to Brussels; but Carne pressed so urgently for it that she gave the answer (detailed, as in No. 340). He carried this answer to Winchester at Antwerp; and on his return said that it had been communicated to the King, and showed the enclosed note requesting permission to draw 1,200 lasts of wheat besides other provisions. Desires them to point out to the King the unreasonableness of his request, equal to 32,400 muids of wheat, the withdrawal of which would gravely increase the scarcity here. It is quite impossible either to grant the request or even supply the quantity; for although the Ambassador maintains that there is plenty in Juliers and Cleves, it is certain that the virtal of wheat which usually costs 10 or 12 sous is now worth 36 sous. According to the terms of the treaties, requests for victuals should be dependent upon the capacity of the country; and, upon that principle, she should forbid export of any foodstuffs. Carne has since brought hither the man authorised by the King to purchase the wheat, and request passport for 80 lasts from Cleves, part of which is already shipped at Dordrecht. Declined to grant such a passport but consented to his exporting 100 lasts of Eastland wheat from Amsterdam, sufficient for the troops and fortresses, with 100 tubs of butter, 100 "libures scepponts" of cheese, and 2,000 hams. The Ambassador seemed dissatisfied. Winchester, requesting passage for Conrad Penninck's infantry, was told that, in view of the damage done in the last two years by the men of Landenberger and Von Reiffenberg, the Emperor required that Penninck should first come to see the writer. 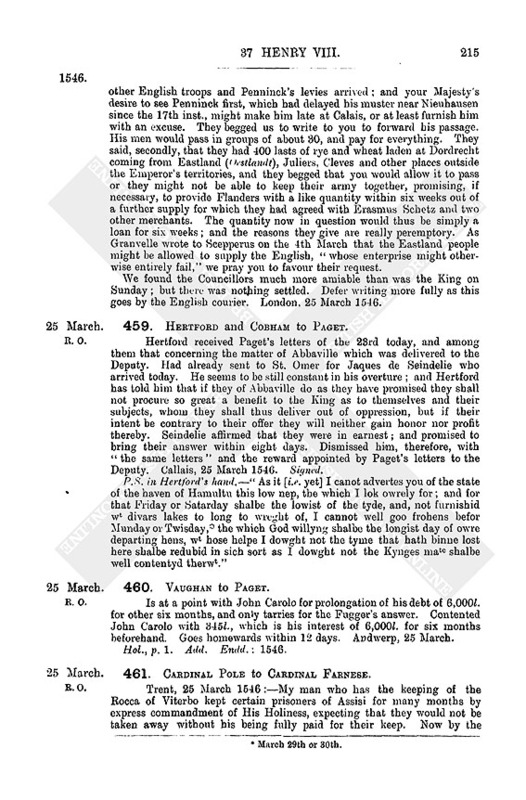 Now Carne says the King's commissioners write that having learnt from Winchester that, the Emperor consents to the passage, they intend to muster the men at Nieuhausen in Munster and despatch them in small bands before Penninck comes. This being contrary to the terms of the Emperor's consent, she has asked Carne to direct the commissioners to send Penninck to her with all speed, or the troops may find themselves stopped. Mr. Adrian van der Burgh is on his way from Utrecht, and will at London show you his instructions. Understands that someone is coming hither from England to the same effect and would know particulars. Binche, 24 March, 1546. Meeting at Greenwich, 25 March. Present: Privy Seal, Admiral, Winchester, Cheyney, Gage, Browne, Paget, Petre, Sadler, Riche. Business:—Letter to dean of Windsor to receive Lord Maxwell's younger son, in like form to that to Sir Robert Dormer, Passport for Robert Peper to Guisnes, where Lord Graye of Wilton first gave him passport hither. Letter to Stephen Vaughan that, on seeing his letters of the —— (blank) inst., the King approved his bargain with Erasmus Skeetz and delay of payment of the 6,000l. to John Carlo; commanding him to deliver 2,000l. Fl. to Wm. Damosell and bring the rest in his hands to Sir John Haryngton at Calais. Warrant to —— (blank) to pay bearer, Robert Legge, treasurer of the King's ships, the amount due upon his bill for his fee as Controller of the ships to Christmas 36 Hen. VIII., &c. (specified), which, after deducting a sum advanced by John Wynter, late treasurer of the ships, amounts to 109l. 19s. 4d. 457. The Privy Council to Brend and Brigantyn. After great difficulty made for the passing of Courtpennyng's band unless he first come to speak with the Regent, we have at last obtained licence for their passing, 80 or 40 in a company; and you must take order with Curtpenyng that after they pass the Mase they keep one way to Calais, passing by Bynkes, and so through Haynald and by Doway. Lest "rascall or other idle persons do thrust themselves amongst the companies," to the inconvenience of the Emperor's subjects, each captain must give a mark or token to every soldier under him, whereby they may be known; and in anywise they must pay well for all they take by the way. Advertise this bearer at large what musters you have taken, what number they be, when they depart, and what way they take. Grenewich, 25 March 1546. Draft corrected by Paget, p. 1. Endd. : The Counsayl to Brend and Brigantyn, xxvjo (sic) Martii 1546. 458. Scepperus and Van der Delft to Mary of Hungary. After dinner yesterday the bp. of Winchester, the Master of the Horse and Mr. Paget came to say that the French intended to attack Hertford's army, which (qu. who?) left here on Monday last, (fn. n3) before the other English troops and Penninck's levies arrived; and your Majesty's desire to see Penninck first, which had delayed his muster near Nieuhausen since the 17th inst., might make him late at Calais, or at least furnish him with an excuse. They begged us to write to you to forward his passage. His men would pass in groups of about BO, and pay for everything. They said, secondly, that they had 400 lasts of rye and wheat laden at Dordrecht coming from Eastland (Oestlandt), Juliers, Cleves and other places outside the Emperor's territories, and they begged that you would allow it to pass or they might not be able to keep their army together, promising, if necessary, to provide Flanders with a like quantity within six weeks out of a further supply for which they had agreed with Erasmus Schetz and two other merchants. The quantity now in question would thus be simply a loan for six weeks; and the reasons they give are really peremptory. As Granvelle wrote to Scepperus on the 4th March that the Eastland people might be allowed to supply the English, "whose enterprise might otherwise entirely fail," we pray you to favour their request. We found the Councillors much more amiable than was the King on Sunday; but there was nothing settled. Defer writing more fully as this goes by the English courier. London, 25 March 1546. 459. Hertford and Cobham to Paget. Hertford received Paget's letters of the 23rd today, and among them that concerning the matter of Abbaville which was delivered to the Deputy. Had already sent to St. Omer for Jaques de Seindelie who arrived today. He seems to be still constant in his overture; and Hertford has told him that if they of Abbaville do as they have promised they shall not procure so great a benefit to the King as to themselves and their subjects, whom they shall thus deliver out of oppression, but if their intent be contrary to their offer they will neither gain honor nor profit thereby. Seindelie affirmed that they were in earnest; and promised to bring their answer within eight days. Dismissed him, therefore, with "the same letters" and the reward appointed by Paget's letters to the Deputy. Callais, 25 March 1546. Signed. P.S. in Hertford's hand.—"As it [i.e. yet] I canot advertes you of the state of the haven of Hamultu this low nep, the which I lok owrely for; and for that Friday or Satarday shalbe the lowist of the tyde, and, not furnishid wt divars lakes to long to wreght of, I cannot well goo frohens befor Munday or Twisday, (fn. n4) the which God willyng shalbe the longist day of owre departing hens, wt hose helpe I dowght not the tyme that hath binne lost here shalbe redubid in sich sort as I dowght not the Kynges matc shalbe well contentyd therwt." Is at a point with John Carolo for prolongation of his debt of 6,000l. for other six months, and only tarries for the Fugger's answer. Contented John Carolo with 345l., which is his interest of 6,000l. for six months beforehand. Goes homewards within 12 days. Andwerp, 25 March. 461. Cardinal Pole to Cardinal Farnese. Trent, 25 March 1546:—My man who has the keeping of the Rocca of Viterbo kept certain prisoners of Assisi for many months by express commandment of His Holiness, expecting that they would not be taken away without his being fully paid for their keep. Now by the importunity of the parties, he has been constrained to send them to Rome without being fully reimbursed. Begs Farnese to see his man satisfied and thus saved the expense of suing for payment. Refers, for particulars, to his mastro di casa, the bearer. Ital. Modem transcript from Rome, p. 1. Headed: Reginaldus Cardinalis Polus ad Card. Farnese. n4. March 29th or 30th.